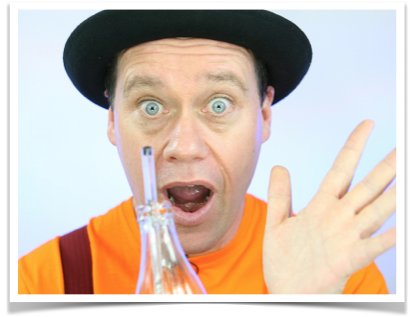 Learn magic tricks like this mind blowing levitating pen in bottle trick and you will stand out from the crowd. This telekinesis pen levitation trick is serious stuff and still really easy to do. Once you’ve mastered the technique of making the pen move and lift (seemingly with the powers of your mind), work on your presentation. This mystical magic trick is enhanced with a really good performance. Click here to learn how to make your own invisible thread for this magic trick. This is the secret of how to do the telekinesis pen levitation. The next steps will take you through the making process of the gimmick of the telekinesis pen levitation. You will need the pen and invisible thread for the first step. * For the purpose of the instructions, I used black cotton thread so that you can see what to do with your invisible thread. 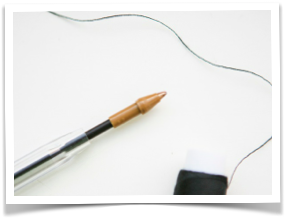 Remove the ink chamber of the ball point pen from the plastic tube (see the picture). Wrap the end of a piece of invisible thread around the tip, like shown in the picture. 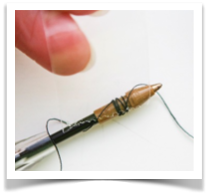 Secure the thread around the tip of the pen with a small piece of see through sticky tape. Don’t use too much else it will stop the ink chamber from going back into the plastic tube and you want the pen to look un-gimmicked. Push the ink chamber back into the tube, now with the invisible thread tied around it. 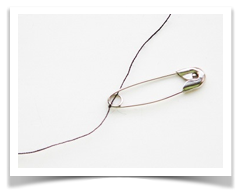 Tie the other end of the piece of invisible thread to a safety pin. This takes lots of patience! To learn magic tricks takes lots of patience, so take the time. You will use the pin to connect the thread to your clothing (hidden of course). You are nearly ready to perform the telekinesis pen levitation. Place the pen tip point down, into the bottle. I’ve used a clear bottle as seeing the pen moving inside is all the more magical. Attach the thread to your clothes with the safety pin. Make sure that it is hidden from view. 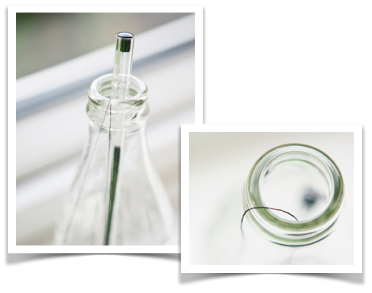 The thread now runs from the pen over the rim of the bottle to you. Be careful with your movements as the tread might snap if it gets caught by accident. You are ready to perform the telekinesis pen levitation. By moving the bottle closer and further away from yourself, the pen will move and levitate in and out of the bottle as if powered by your mind! You have made and performed the telekinesis pen levitation! To learn magic tricks like this are easy and fun and you can amaze your friends and make you stand out from the crowd.